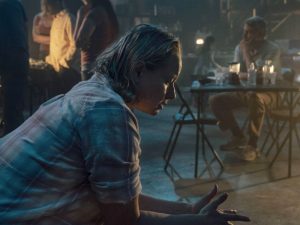 While Hilltop's new captive reveals more about her childhood and the leader of the Whisperers, the newcomers put their place in the community at risk by striking out in search of Luke. Last edited by GateWorld; February 19th, 2019 at 07:48 PM. I liked this, but I think there was a real missed opportunity here to really do a deep-dive into the backgrounds/parents of our lead characters, and how that influenced why each of them is the way they are today. Could've been a really nice piece on the importance and impact of role models in peoples' lives. Which is not to say I disliked the episode, I just wish it could have been....more. Likewise. I have been waiting for this shift back to what makes horror good. Nothing but praises for s09 so far. Well to be fair, this is what, the second episode that we see Alpha, or more like, the first one we see her actual face? There is still plenty of time for that, revealing all of it in one episode wouldn't have been satisfying to me, personally. I love how they confuse the viewers with those bogus flashbacks. Had my doubts the whole episode in regards to those actually, and turns out I still don't know which version was true. I guess the latter (dad is a good guy, but bad soft dad). Although, the lady in Talking Dead did say that Alpha's daughter somehow realized how she had been brainwashed during the interrogation process. No, sorry -- that's my fault for not being clearer. What I meant to get at there was that...we had this entire episode that was exploring Lydia's origin story by showing who her mother is, right? That's great and all, but by itself I think it was less than it could have been. I think it would have been a better episode if they had picked a character (or even multiple characters), and done their backstories in the same episode. I think it would have been a more interesting episode overall if we'd had, for instance, a contrasting pair of background stories--say for instance Henry talking about growing up with Ezekiel and Carol for parents and how they shaped him into a good person he is today, and then juxtaposing that against Lydia growing up with her psycho mum, and how that shaped her into the deceitful possibly-psychotic person that she is today. I'd have been interested in deeper backstories for any of our existing characters, but I specifically pick Henry here because I think it would've been a good opportunity to use flashbacks to show some of the growth/evolution/changes in the Kingdom during the time-skip years that we haven't seen. (And I think that might also have been a good contrast -- building and growing in the Kingdom vs. the savage survival of the Whisperers). Again, I didn't hate the episode or anything. I just think it was a missed opportunity to be something better. All good, just making sure we talk about the same thing. I do agree that there is almost no backstory to every characters in TWD. Even more so, a scene I found very interesting was the state of things at the beginning of the outbreak (day 23 written on the wall). Apart from FTWD we didn't get anything other than the Rick Grimes scene back when... like Season 1-2? I would love to see for instance, Negan as a priest or something that really contrast with what kind of man he had to become to survive. It's a stupid example but you know what I mean. I know there's been more stories that I've not seen since this one.... But at this point at least.. It's not too late for them to show more parental back stories of the lead characters. I actually was really thinking that we were going to see a flashback for Daryl to his dad beating him... but it didn't go there. The problem with what you were suggesting is time. To fit in 2 different backstories in the 1 episode, would have been very busy, and probably done justice to neither. This at least gave us a good story for Lydia. Maybe we'll see more of the other character's parents in the future.